HUTCHINSON, Kansas. 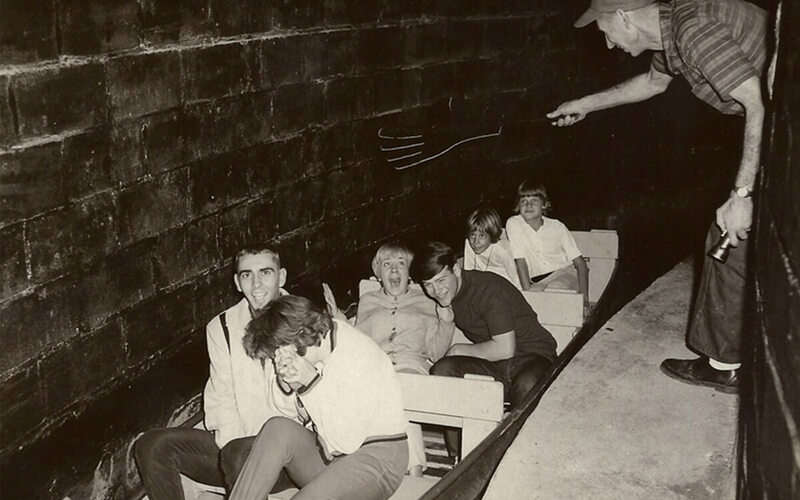 — In the mid-1970s, a high school student attending the Kansas State Fair decided it would be fun to pour laundry detergent into the water as he rode along the Ye Old Mill. 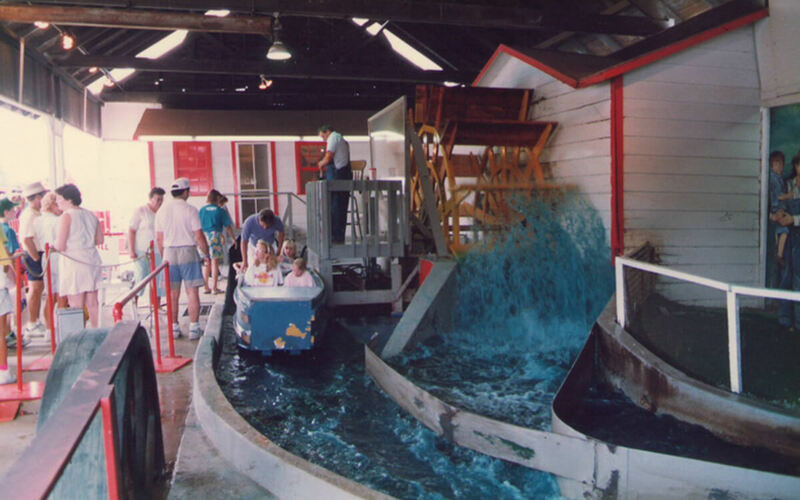 It took hours and hours to evacuate the ride, remove the soap and refill the tunnel. This is just one story, but one can be assured there are many more after surviving 100 years in the rain, snow, and heat, not to mention the mischievous and playful riders. 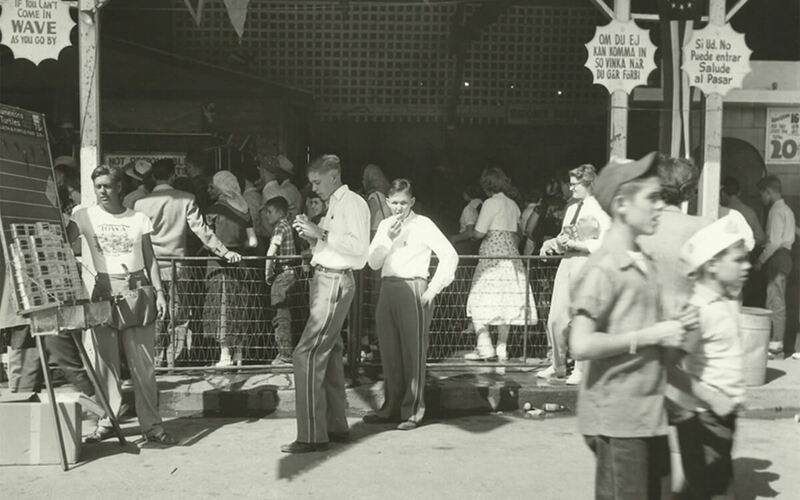 It has been a formidable feat for Kansas’ Ye Old Mill ride and that is one reason the Kansas State Fair will feature its ride’s 100th birthday this year. It’s also a piece of amusement ride history. 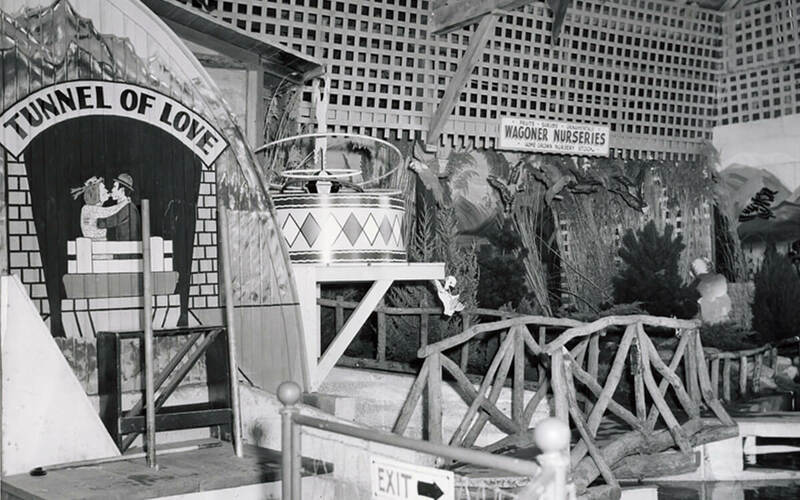 Built by John Keenan, there are only five Ye Old Mills, or Tunnel of Love rides as most were originally known, left operating today in the U.S. Three of those are on fairgrounds. Other than the Kansas State Fair, the Minnesota State Fair, St. Paul, and the Iowa State Fair, Des Moines, still have operating Ye Old Mills. The two not on fairgrounds are at Playland Park, Rye, N.Y., and Kennywood, West Mifflin, Pa., the latter dating back to between 1899 to 1901. Old Mill ‘s generally only negative the course and do not feature a drop similar to the Mill Chute ride. The Ye Old Mill entails unaccompanied boats floating on waterways through dark tunnels, propelled by a large paddle wheel. The boats meander through the waterways gently knocking against the sides and sometimes even against other boats. Most of these rides existing today have seen some changes, but most have changed the theming not necessarily how the ride operates. 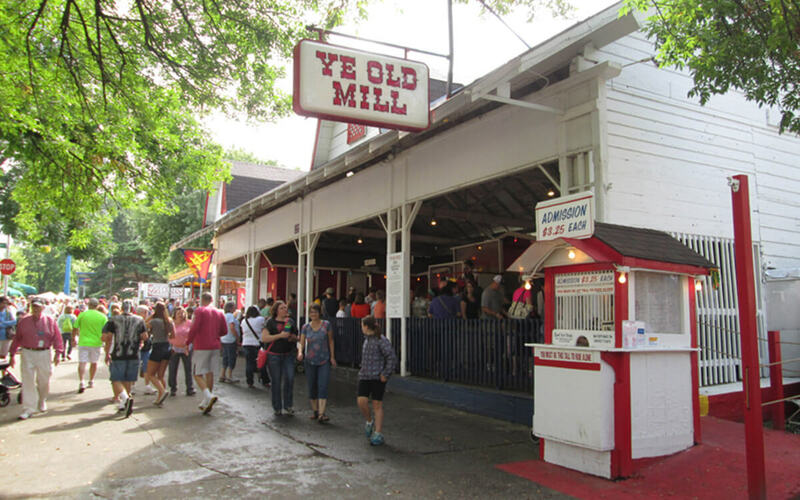 The Ye Old Mill at the Kansas State Fair was originally called Ye Old Mill, Tunnel of Love. It is now the Ye Old Mill, Tunnel of Terror. There are currently eight boats on that ride and they are still moved like they were moved 100 years ago. It takes three minutes to complete the ride and 87,000 gallons of water to fill the water tunnel. It is owned by the fair and is only open and operated during fair time, set this year for Sept. 11-20. Yet, even though it operates only 10 days out of the year, it maintains its popularity. It will attract approximately 24,600 riders during that time. Through the Kansas ride, riders encounter a growling and shaking skeleton character that holds a spear in his hand. He grows from eight feet to 13 feet. They encounter a floating and moaning ghost, and a large dragon that turns its head toward the boats while snorting smoke and making a lot of noise. “The last scene is an evil clown that shoots water from its nose toward the boats while laughing,” Groene said. 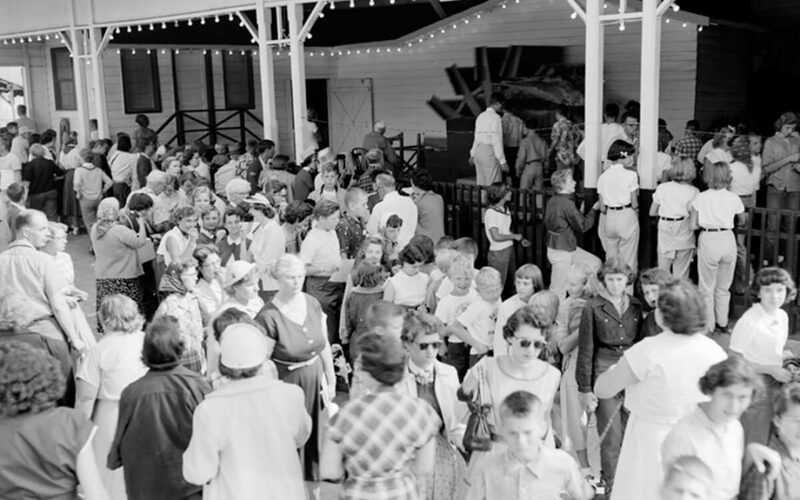 The Kansas State Fair is celebrating its Ye Old Mill’s 100th anniversary by theming the 2015 Kansas State Fair Museum’s exhibit “Year of the Ride.” The museum, open to the public during the fair, will feature vintage photos and an original boat from the Ye Old Mill, as well as other rides that have been on the fairgrounds over the years.. The Minnesota State Fair Ye Old Mill is also 100 years old this year and will be a featured attraction during its 2015 edition set for Aug. 27-Sept. 7. The Iowa State Fair Ye Old Mill is a little younger than the other two. Construction on that ride began 95 years ago. It took four years to complete. According to Brienna Schuette, Minnesota State Fair marketing and communications manager, the Ye Old Mill on their fairgrounds is still owned and operated by the third, fourth and fifth generations of the Keenan family. This ride also has kept more to the theme of the original ride. It is quiet and dark, with scenes of gnomes and leprechauns that were updated by local artists in 2011. The Ye Old Mill at the Iowa State Fair is that fair’s oldest permanent amusement ride. Owned by the fair, it has been in continuous use since it was built. The original waterway was constructed of tarred wood. In 1996, the wheelhouse and 950-foot long canal were completely reconstructed to the exact specifications of the prototype. The boats were replaced but were specifically designed to look like the originals. The bright red paddle wheel remains the only vestige of the original Mill. It has 11 boats and the duration of the ride is approximately three minutes. It also operates just during fair time. Like the Kansas edition of the ride, theming is scarier than the older romantic theme. This article first appeared in the June 2015, issue of Amusement Today, and is reprinted here courtesy of Amusement Today. For subscription information, visit AmusementToday.com.